The most satisfying Thanksgivings I’ve had have been with friends. With friends, it’s a Friendsgiving: I feel like I can be myself, I know that the feeling is mutual, and I don’t have to deal with any distant cousins who want to turn the table into a political Thunderdome. But the best part is that the rules that we assume about Thanksgiving don’t apply. We can throw tradition out the window and serve the food we want, play the music we want, and invite whomever we want. I’ve been a big fan of Friendsgivings for decades, ever since the first time my mom invited all of her friends over for dinner one year. I’ll always remember that she put on Lady Gaga’s discography at dinnertime. Gaga or not, if you want to get in on the fun and host all of your chosen family this holiday season, here are some of the things I’ve learned. Let’s be real: You’re going to want to use disposable plates. It just makes sense, especially if you’re one of those people (read: like me) who own maybe four or five dinner plates and have a whole gaggle of friends coming over. Plus, if a few folks spontaneously show up or suddenly bring partners along with them, making them feel welcome is just a matter of pulling out some extra plates. Like any good host, if you want to encourage mingling, giving your guests plates they can comfortably walk around with is super helpful, too. Dishware from SOLO also makes cleanup so much easier, so you can talk to your friends after dinner instead of being stuck in the kitchen scrubbing stuffing off every dish you own. When it comes to actually dishing up the food, it often makes more sense to set dishes up buffet-style on a central table or counter. This works great if you’re using those disposable SOLO plates from earlier -- especially for your guests who already chucked their dishes before realizing they absolutely needed one last mountain of mashed potatoes. One really helpful thing to do with table settings, especially if you’re having a potluck-style dinner, is to make little signs to label the food and who brought it. Info like potential allergens can be life-saving, too. 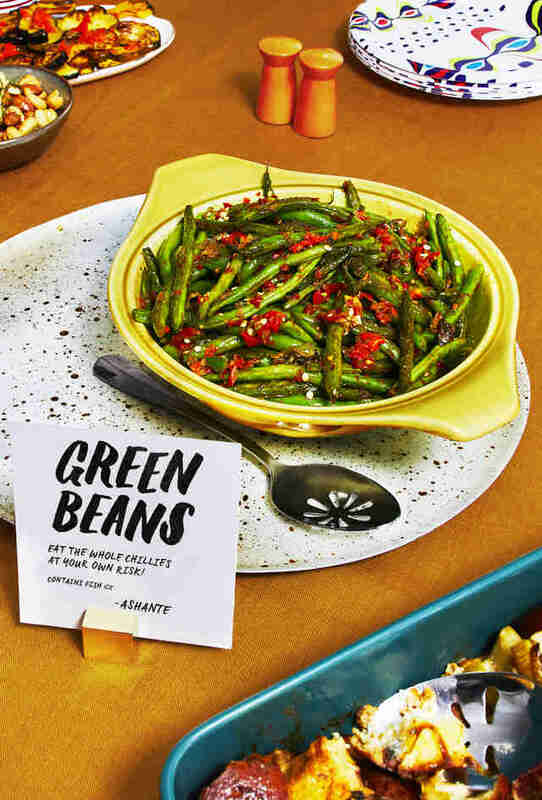 If space allows, encourage your guests to share a line or two about the story behind the dish, like who taught them how to make it, what it means to them, or where they first tasted it. You might think that hosting would require heavy executive functioning skills, but it’s not that serious. 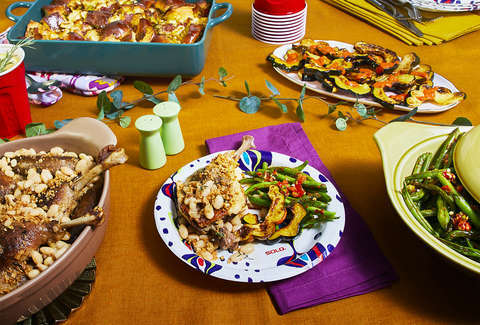 Save yourself a headache by making the party a potluck. When it comes to the food folks bring, avoid an “Oh crap, we only have chips” situation by assigning dishes based on last names. For example, people with last names that range from A-F can bring cold appetizers, while G-L can bring side dishes, and so on. And don’t just stop at food! Take advantage of your friends’ talents and ask them if they’d like to contribute to the party as DJs, bartenders, reiki healers, or whatever else you might need that night. If you’re mixing friend groups, definitely don’t forget a name tag station. Encourage folks to put additional information on the tags, too, like pronouns, fun facts, or life goals. Another way to stoke fun conversations is to set up games for after dinner. If you have room, get a few different activities going. You can put out playing cards, coloring pages for kids, or fun indie games like You Think You Know Me or The Metagame. For centerpieces, think beyond the turkey. 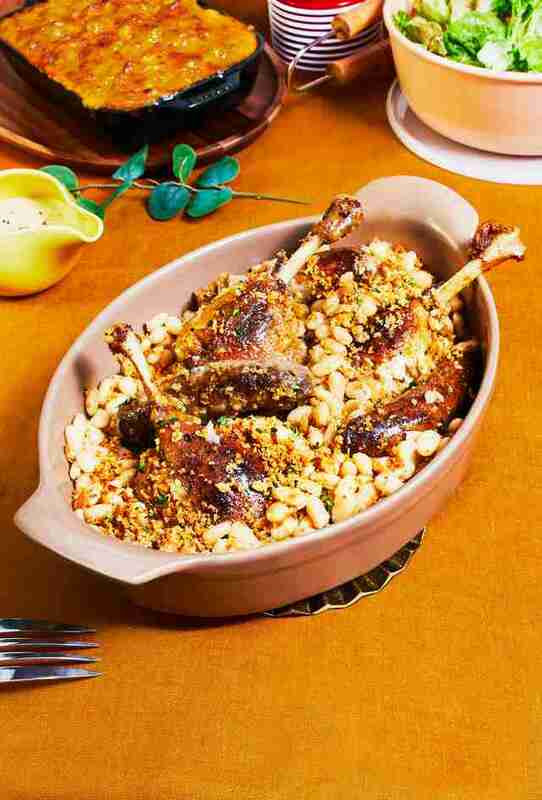 A duck and bison sausage cassoulet served up casserole-style would be a rich and tasty alternative that uses the best of what traditional American foodways have to offer. Ojibwe cookbook author Heid Erdrich’s version uses butternut squash, juniper ash, and navy beans, and it’s an absolute showstopper. Other ideas that I’ve tried in the past include chef Yotam Ottolenghi’s chicken and potato sofrito, a roasted porchetta rolled up with lemongrass and other Vietnamese aromatics, quail tempura, and cast iron-seared wild mushroom steaks with blue cheese fonduta. For dessert, I always go for something easy to dole out when people are starting to feel a bit sluggish. 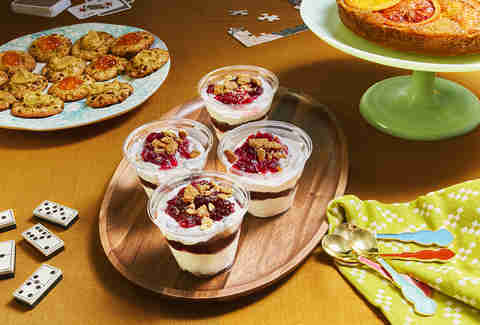 People like a good parfait, for example, and building them in disposable SOLO cups make them a cinch to serve. Try cooking down a seasonal fruit like apples, pumpkin, or cranberries, and layer with plain yogurt and a spiced granola. A sheet cake works great, too -- I like cookbook author Julia Turshen’s pumpkin and olive oil cake, which is super easy to cut up and share with company. The big centerpieces are great, but if you’re anything like me, the money’s on the sides. One of my faves is really simple to prepare: whole green beans blistered in a cast iron pan, topped with crispy fried shallots and herbs, and drizzled with Thai-style nam prik. What I like about sides is that they can tap into global flavor combinations that might unexpectedly complement each other, like kabocha squash mac & cheese or Chef Edward Lee’s braised collards and kimchi. And instead of your standard stuffing, try making a bread pudding with local produce mixed in or a Creole-style oyster dressing. 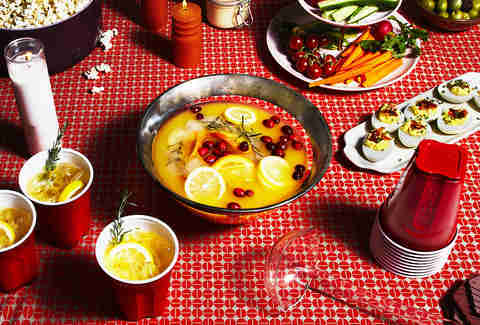 Since Thanksgiving-style food often tends to be salty and rich, aim for drinks that lean acidic. A citrus-heavy punch makes for a nice centerpiece, and a handful of rosemary can subtly shift the flavor towards autumn. It also makes a great non-alcoholic option. Another nice autumnal beverage option, which I picked up from Julia Turshen, is a bourbon Old-Fashioned sweetened with maple. If you want to get real wild with your blender, custom milkshakes can be really fun, with flavors like pumpkin pie, cranberry, maple walnut, or whatever you can come up with. And pro tip: Red SOLO cups and the clear SOLO cups you bought for parfaits are great as cocktail and milkshake glasses, so you can keep your costs -- and your cleanup duties -- to a minimum.